The Arkansas Gazette Project began in January 2000 to collect and preserve the history of the "oldest newspaper west of the Mississippi," which ended its operations in 1991. These interviews preserve the publication's legacy as Arkansas's "newspaper of record." Hugh B. Patterson Jr., Ralph B. Patterson, and Carrick H. Patterson have provided generous financial support for this endeavor. Roy Reed, a respected journalist and professor, directed this project. Along with other journalists, he conducted interviews with former Gazette employees. Reed began his career as a reporter for the Gazette, where he covered the desegregation crisis in Little Rock. He later covered the civil rights movement and the White House for the New York Times. He also taught journalism at the University of Arkansas for sixteen years. Reed published Looking Back at the Arkansas Gazette: An Oral Histor y in 2009. 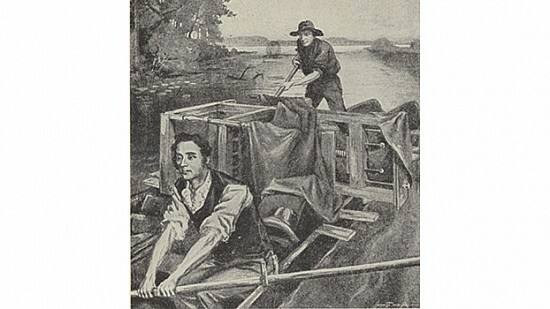 Sketch of William Woodruff sailing up the Mississippi River with his printing presses in 1819.